Under moderate heat conditions the fans can be run without the air-conditioning, slashing operating costs on the order of 90% (vs. air conditioning) while producing a pleasant open-air environment. This makes them excellent for early summer (like right now in many parts of the country), spring, late summer, and early fall. For areas that see this kind of weather frequently, where static air is unpleasant and air conditioning might be overkill, these ceiling mounted fans are absolutely perfect. On hot days, the fans let you set your air-conditioning thermostat set 10-15 degrees higher and get the same cooling effect. This amounts to big savings on air conditioning bills as we reach the height of summer. This works great in the evenings of multi-shift operations as well. 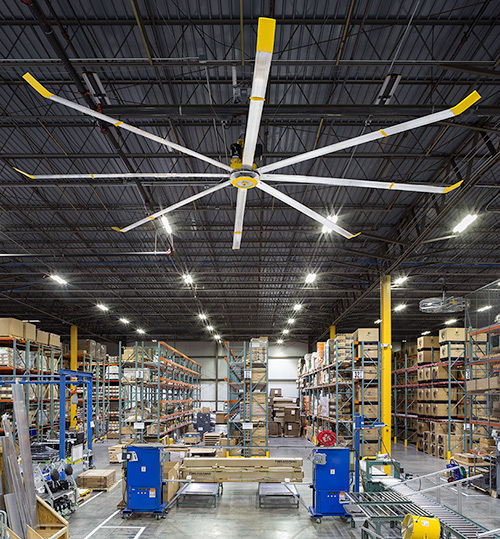 Due to better air mixing, HVLS fans reduce the amount of cool air that has to be continuously replaced with hot outside air to achieve adequate ventilation. In a system designed around fans, cool air distribution costs will be reduced up to 75%. In new construction, the cost of the fans may be completely offset by the elimination of expensive ducting and the reduction in air-conditioning capacity.